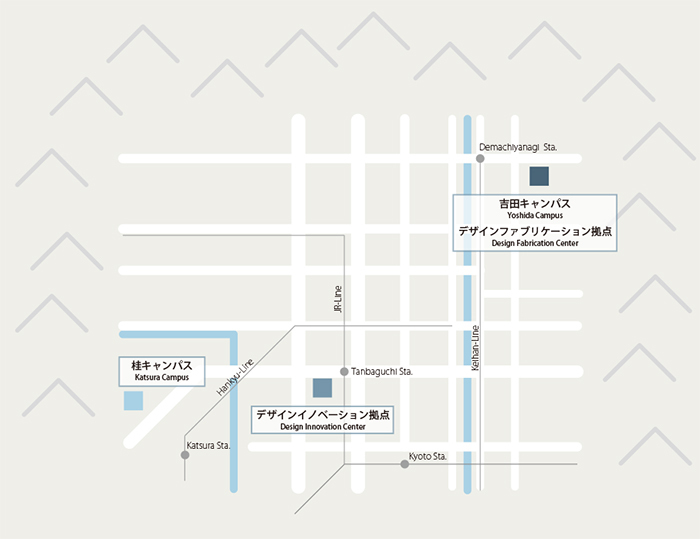 Kyoto University Design School has two bases for its activities: the Design Innovation Center and the Design Fabrication Center. The Design Innovation Center is in the Kyoto Research Park (KRP), which is located midway between Yoshida Campus and Katsura Campus. Taking advantage of the fact that the KRP is a base for businesses and local government agencies, the Center serves as a hub of the program’s industry-government-academia collaboration activities. The Design Fabrication Center in Yoshida Campus, built at the site of a former mechanical engineering research factory, has been refurbished with state-of-the-art digital fabrication technology that allows students and researchers from various fields to work collaboratively in actualizing ideas through prototypes, performances, discussions and presentations. Shuttle bus service is provided between the two campuses and the KRP for easy access.